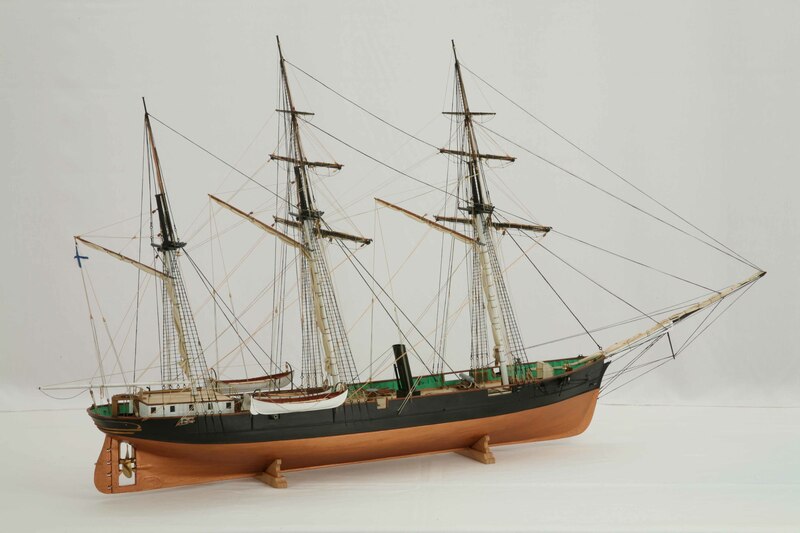 The screw clipper STRELOK was one of six sister ships that were built in winter 1855/1856 in Arkhangelsk, to avoid the British blockade during the Crimean War. They were intended as light cruisers against the British merchant marine, but the war was over before they could be put in use. The STRELOK served 1858 – 1862 in Far East and Northern Pacific, i.e. charting the Sea of Japan. The ship is mentioned in the list of Russian steam frigates of 19th century. The STRELOK became somewhat famous by having Mikhail Alexandrovich Bakunin as a passenger on his flight from Russia to Japan and back to Europe in 1861. In 1878 the ship was decommissioned. This model of the STRELOK is an elegant masterpiece, built by a very experienced ship modeller. It is an excellent piece of work in detailing the hull and rigging. The ship model is 1 : 67 scale. Length is 105 cm, width 32 cm, height 56 cm. With the ship model went a purpose-built display case. The display case length is 110 cm, width 40 cm, height 60 cm. The ship model was built with the sails tightly furled. The machinery at the stern to raise the screw out of the water when sailing is clearly shown.